When you need maintenance repair for your seasonal tools, come to Burke Landscape Supply. We repair your equipment using genuine parts. 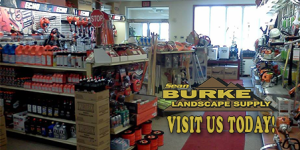 Burke Landscape Supply in Trainer, PA is your Landscape Equipment Sales Repair center serving all of Delaware County, Chester County and parts of Montgomery County. And, we use and sell genuine parts. We have two repair service centers located to serve all of Delaware County including Thornton. Our customers travel from areas like Newtown Square, Drexel Hill, Media, Aldan and even Thorton, PA. Availability should be just one factor when you think about Burke Landscape Supply for your Landscape Equipment Sales Repair 19373. Our expert and credible services are top notch. Delaware County turns to Burke to keep their outdoor power tools running and working well. We will use manufacturers specification on your lawnmower repair. Call on Burke Landscape Supply to meet your STIHL, REDMAX, ECHO, FERRIS repair parts needs. Our repair practices help to keep your equipment maintenance costs down. Burke Landscape Supply can Maintenance & Repair your mowers, trimmers, blowers, & more in Delaware County, PA. Well running tools are crucial in the proper maintenance of your landscaping needs. We service eXmark, Ferris, Echo, RedMax and STIHL lawn and landscaping tools. Your landscaping is an investment. And so are the tools. We carry a vast selection of outdoor power equipment. Call us for your Landscape Equipment Sales Repair Thorton, we even have great pricing on landscaping tools like lawn mowers, chain saws, trimmers and more. We sell and service eXmark, Ferris, ECHO, RedMax and STIHL. Burke Landscape Supply sells and repairs both landscape contractor and residential equipment. We provide repair service on most power equipment. Whether you’re a lawn company, landscaper, or using outdoor tools like chain saws, blowers & fans, look to Burke Landscape Supply to find replacement parts for the top manufacturers. Come to Burke Landscape Supply for the best products from eXmark, Ferris, ECHO, RedMax and STIHL. We have your Lawn and Landscaping tool parts needs. Call us at 610-494-9490 for your landscape Equipment Sales Repair 19373! Seasonally, we have a full line of winter supplies and maintenance parts for your snow plows and salt spreaders.